National Day of Action Thursday, April 19! By April 25, the Department of Homeland Security will decide the fate of thousands of immigrants from Nepal who have Temporary Protected Status (TPS). That is the deadline for a decision on the renewal of TPS; the designation was originally made following a devastating earthquake in Nepal in April 2015, and had been renewed in October 2016. Recovery has been slow and many people remain displaced. However, the Trump Administration has been terminating TPS programs -- so far for Haiti, Nicaragua, El Salvador and the Sudan. The renewal date for Honduras is fast approaching, and reconsideration for TPS designation for several other countries also comes up through the year. Participate in an online Day of Action tomorrow, Thursday, April 19. Click here for a social media kit with sample messages and graphics you can use. If you're in Washington, DC tomorrow, attend a TPS for Nepal Congressional Briefing. Click here for more information and to RSVP. Call 202-224-3121. Follow the instructions and make sure to stay on the line to be connected to both of your U.S. Senators and your Representative. "Hello, my name is YOUR NAME and I live in YOUR CITY, STATE, ZIP CODE. 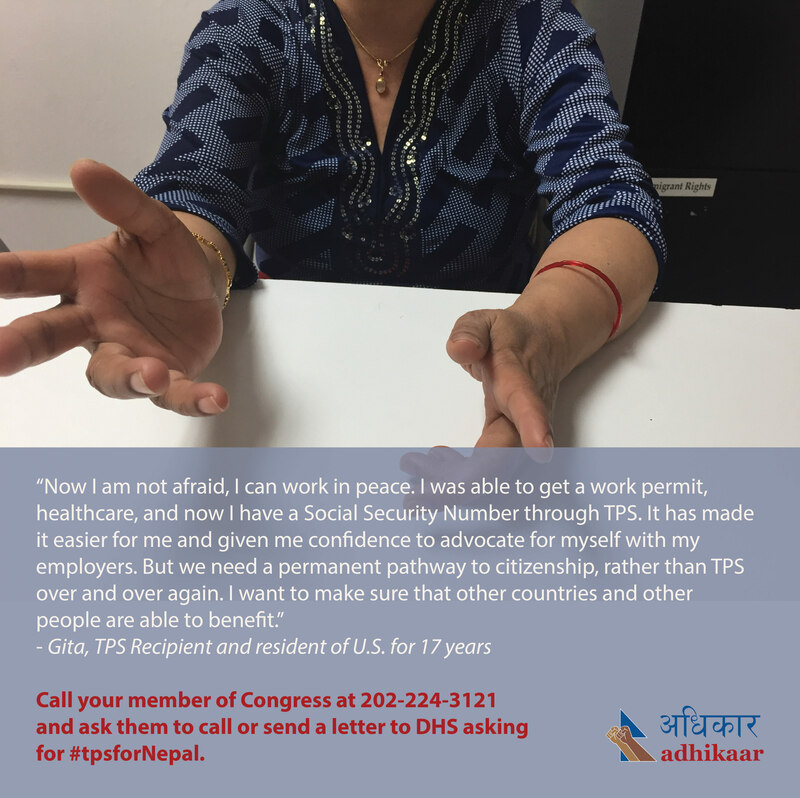 I support the Nepali community and request that Representative/Senator NAME support TPS for Nepal by sending a letter or calling DHS directly. DHS will make a decision on Nepal TPS by April 25, so we need your office to tell DHS to renew TPS for Nepal now. Thank you." You can learn more about TPS for Nepal by visiting Adhikaar's Facebook page and website, which includes stories from TPS recipients and a report on Nepal's country conditions.